More than 10,000 people have signed our petition calling for an end to Sneaky Fees. We’re calling for all-inclusive pricing rules to make retailers disclose the full costs upfront and protect consumers from hidden fees. These fees often disguised as "booking fees", "service fees" or even "print your own ticket fees" are added to the advertised prices of goods and services. They can add anything from a few dollars to more than $50 to the product price. All up, consumers are paying millions. We estimate retailers could be earning $68 million each year from fees charged on top of the headline price. Our latest survey found more than two-thirds of consumers have been stung by these fees. For some, it’s a regular event. Of those who’d discovered extra charges added to their bill, 39% had forked out extra on at least 3 occasions in the past year. The majority of Kiwi consumers agree new rules are needed. 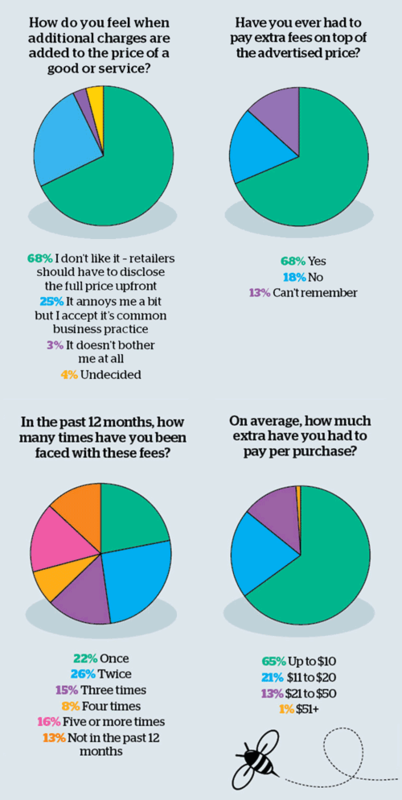 68% want retailers to be required to make the full price clear. Our data are from a nationally representative survey of 1024 New Zealanders aged 18 and over. The survey was carried out online in December 2016. Figures may not add to 100% because of rounding. The margin of error is +/-3.06%. Price plays a huge part in consumers’ purchasing decisions. But when advertising obscures a product’s real cost, consumers can be misled into making decisions they would not otherwise have made. The Fair Trading Act prohibits misleading representations about price. But it hasn’t been effective at stopping sneaky fees. Companies point to small print or other disclaimers as evidence they’ve provided sufficient information about additional purchase costs. CEO Sue Chetwin (right) presenting our petition to Minister of Commerce and Consumer Affairs Jacqui Dean. Other countries provide better consumer protection. Across the Tasman, companies are prohibited from advertising a component of a price without prominently displaying the total amount the consumer must pay. The Commerce Commission has previously recommended similar rules be included in laws here. In a 2012 submission to the Commerce Select Committee, it said all-inclusive pricing provisions would “substantially assist” enforcement of the Fair Trading Act. The commission pointed to a growing trend of retailers separating out additional costs from the headline price. In many cases, “these additional costs are buried in the fine print or otherwise inadequately disclosed”, it said. But when consumer law reforms were being considered by the committee, Ministry of Business, Innovation and Employment officials advised against all-inclusive pricing rules because they didn’t think there was a “sufficient problem” to justify intervention. However, our research shows the problem is real and, with the rise of online trading, looks set to get worse. When goods and services are bought online, we’ve found extra fees may only be revealed near the end of the purchase process. Not only does the practice mislead consumers, it also makes it difficult to compare prices and gives the retailer an unfair advantage over companies that are upfront about costs. All-inclusive pricing rules would ensure consumers can easily identify the price of a product. Online florist Petals advertises flowers priced at $54.95. But extra fees mean the actual cost you pay is $65.90. Competitor Interflora’s advertised price is $63.70. But after fees, the actual cost is $77.20. Holiday rental site Bachcare advertises per night rates of $100. But after service fees are added, you’ll pay $137.50. Tickets to see the Hurricanes are regularly advertised at $25. But after fees, the actual ticket price is $30.38. Tickets to see West Side Story at The Civic were advertised online for $89.90.But the actual price you had to pay was $96.97. At Berkeley Mission Bay, movie tickets are advertised online at $10.90. But after fees, the real price is $12.10. At the Embassy Theatre, extra fees mean $10 online tickets will cost you $11.20. If you’re heading to the slopes, you can find a season pass for Mt Ruapehu advertised at $999. But after fees, the price rises to $1021.48. After fees, you’ll pay $60,890 for a Mitsubishi Pajero Exceed, even though it’s advertised as $59,990. If you’re tempted by the $40,990 advertised price for a new Ford Ambiente, you’ll have to budget $41,880, the actual cost of the car after fees. Let us know of any other sneaky fees you’ve seen by emailing sneakyfees@consumer.org.nz. Book a flight from Wellington to Melbourne on House of Travel’s website and on top of the advertised $139 price you’ll pay a $14.95 “booking fee” plus an $8 credit card fee if you’re flying Jetstar.